In one of the weirdest story combos ever, the Enterprise happens upon a sleeper ship containing three humans who’ve been frozen since the late-1980s. Meanwhile, the Enterprise must head to the Neutral Zone to discover if the loss of several outposts was caused by the Romulans, who (ahem) have been unseen for several decades. Most of the episode is spent explaining the 24th century to the three humans while en route to the Neutral Zone. There, a Romulan warbird appears — apparently, as part of an investigation into what happened to the outposts on their side of the zone, which met the same fate. As neither side has committed a transgression, the Romulans turn around and go home — but not before telling Picard and Co. that their absence is over. “I think all of our lives just got more complicated,” Picard says. Meanwhile, the three 20th-century humans are sent on a slow ship back to Earth, in search of low-mileage pit woofies. Well, this is the first look at the Romulans since way back in “The Enterprise Incident”, other than a stray ambassador and appearance of blue ale in the movies. Their intentions to re-emerge change the math in a major way for the Federation, and started the Ferengi (clearly, the creators’ initial bad guys when TNG launched) on a glide path to comic fodder. Oh, and this is the first time in Star Trek where an actual date is attached to the “current” timeline. 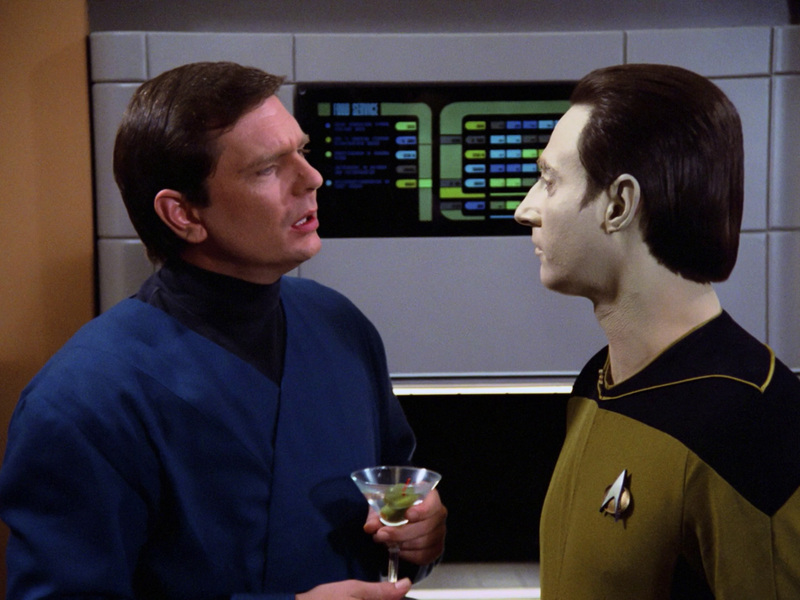 Data tells the 20th-century humans that it’s 2364 — even though, back in “Encounter at Farpoint”, he told Riker he graduated in the “class of ’78”. So, either Data is really, really old (he’s not) or the creators flubbed. The destruction of the outposts appears to have stemmed from a Borg attack. This is stated pretty clearly next season in “Q Who?” — in which the Enterprise finds planets with the same patterns of destruction, in a distant part of the galaxy. How the Borg were around the Neutral Zone and why we didn’t see them again (in Federation territory) until “The Best of Both Worlds” was never really explained. Stranger still, the Romulans’ long absence sure seems at odds with what we learn later — and even some of what we’ve seen in the first season. Allegedly, the Enterprise was off to face some Romulan battle cruisers at the end of “Angel One.” Of course, we never learned what happened with that. 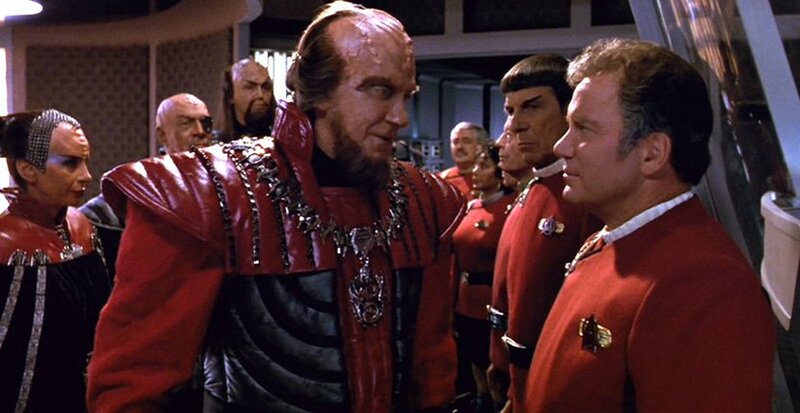 But we know that the Klingons (who likely would have shared intelligence with Starfleet) had somewhat recent dealings with the Romulans, based on Worf’s dialog in “Heart of Glory”. In that episode, we learn that the Romulans attacked and destroyed Worf’s home colony (Khitomer) about 20 years earlier. We learn later that the Romulans and Klingons were allies prior to the attack. There are plenty of other things we learn in TNG, DS9 and Voyager that make this episode fall short (the Romulans’ attack at Narendra III, Picard’s statement that the Romulans have been working to destroy the Federation/Klingon alliance for 20 years, etc.) that don’t work at all with what we see in “The Neutral Zone”. The real problem is that the creators decided to up the stakes in this episode by making the Romulans more mysterious than they really should have been (if only based on first-season mentions). This actually harks back to the introduction of the Romulans in TOS (“Balance of Terror”) when no one in the Federation had ever seen a Romulan. That didn’t make a ton of sense, either, because it relied on the premise that visual communication wasn’t possible in the 22nd century (when we know there was such communication in “Star Trek: Enterprise”). But at least in “Balance of Terror”, the idea that the Romulans hadn’t been around for a century held up. This is really a sloppy episode. The 20th-century human shtick actually isn’t awful — it gives Troi something to do and the interactions between Data and one of the humans is somewhat entertaining. But to mash that story up with something as big and important as the re-emergence of one of the Federation’s most notorious enemies? Who thought that was a good idea? I suppose it sort of works because the episode didn’t appear willing to have the Romulans actually do anything — except some saber-rattling — and something needed to fill the rest of the hour. We already know Data’s fully functional. But is he a toaster? Kirk apparently goes all rogue and takes the Enterprise into Romulan territory without authorization. The Enterprise is quickly surrounded by Romulan ships that have Klingon design and sport new and improved cloaking devices that render ships invisible and (for the first time) hidden from tracking sensors. Kirk and Spock beam over to one of the Romulan ships to face the music and Spock reveals that Kirk has gone nuts and then apparently kills Kirk in a struggle. But it’s all a ploy to get a cloaking device and neutralize the new Romulan threat, and Kirk (alive and well) poses as a Romulan and steals the cloaking device while Spock distracts the Romulan commander (Joanne Linville) by (ahem) throwing her a few curves. The Enterprise barely escapes after Scotty incorporates the cloak on the Enterprise. With the cloaking device in hand, the Federation will be able to negate any new advantage and keep the status quo between the two superpowers. It’s the first time since “Balance of Terror” where the Romulans are more than baddies taking potshots at the Enterprise (or, if you prefer, more than Voyager-style aliens of the week). We learn a lot more about the Romulans and how they’re like and unlike Vulcans. 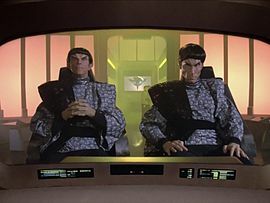 The dialog between Kirk and the Romulan commander is important in explaining the relationship between the two enemies and how the galaxy works in the 23rd century. We learn about steps that could and would be taken after territorial incursions — and just how tense the situation is. Today is a good day … to use our new Klingon ship models and not really explain how the Romulans got them. Well, the conceit that Romulans use Klingon design for their vessels is pretty rich. It’s so hurriedly explained that it clearly wasn’t anything the creators wanted to get into — while the fact that the Bird of Prey first seen in “Balance of Terror” had no warp capabilities (and apparently a very small crew) could have something to do with the choice. Or the creators just really liked the new Klingon design, which was first seen in “Elaan of Troyius” and is pretty badass. There’s also a theory that the Bird of Prey model was lost or damaged, and the Klingon model reused for budgetary reasons. It’s actually kind of funny, because this episode was produced after but originally aired before “Elaan of Troyius,” meaning that the ship first debuted as a Romulan vessel, even though it was first built and filmed as a Klingon vessel. As good as “The Enterprise Incident” is, one wonders if the Romulans wouldn’t be gearing for war after the events here. Granted, the Federation obtained knowledge of the new cloaking device, negating a tactical advantage. But the Enterprise clearly violated treaty — committing an act of war — and Kirk’s presence on the bridge at the end of the episode should have been enough evidence that Kirk didn’t go nuts/rogue. It would have called everything Spock said to push forward that con into question. Is the thinking that the Romulans were ashamed that they’d been out-Romulanned, so they tipped their hats and walked away? Or is this just the first example of season three’s anything-goes approach — like the time Spock removes several days worth of memories to prevent Jimbo from having a sad, or the time Spock has brain surgery twice in a few days without any obvious impact on his hair? This is one of my favorite episodes of TOS, even acknowledging the logical gaffes. 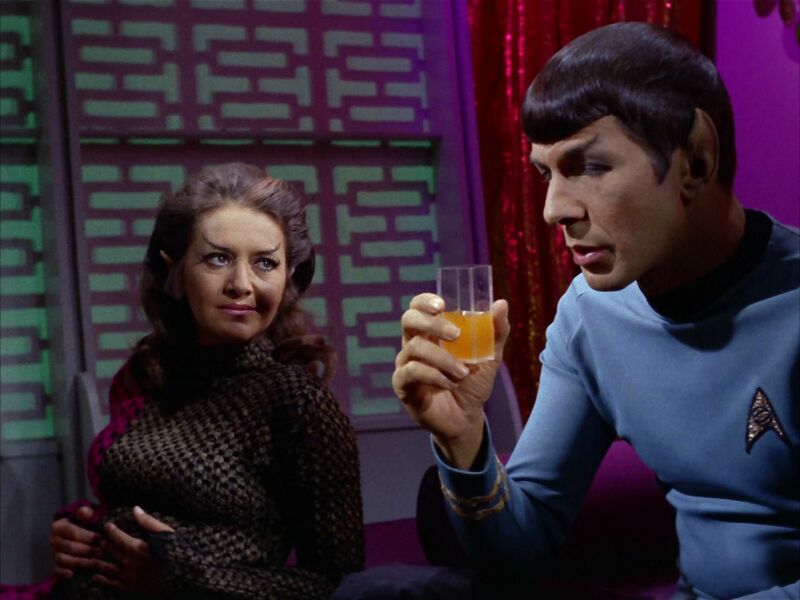 The scenes with Spock and the Romulan commander are, well, fascinating. The writing is taut and the look inside the Romulan ship is, mostly, well done — even if it’s obvious that the corridors from the Enterprise were reused with different lighting. Apparently, the Romulans started using Klingon ship design because the two powers forged some sort of a pact, perhaps an alliance. It’s never mentioned explicitly, but the sharing of any technology is odd, given how much the Klingons and Romulans are shown to hate each other in TNG and DS9. Like other episodes, it opens a can of worms on when, exactly, the Romulans and the Klingons started hating each other and when the Klingons and Federation became allies. More on the weird love triangle between the Federation, Romulans and Klingons when we review TNG’s “Heart of Glory” and “The Neutral Zone” in a few months. “The Enterprise Incident” also stands out because of all the really bad episodes that follow it in TOS’ infamous third season. And while Sulu, Chekov and Uhura are restricted to procedural scenes on the bridge, this episode is one of Trek’s better ensemble pieces. It’s worth noting that there really aren’t that many episodes where all seven of Kirk, Spock, McCoy, Scotty, Sulu, Uhura and Chekov appear — partly because Chekov doesn’t show up at all the in the first season and probably also due to budget reasons. 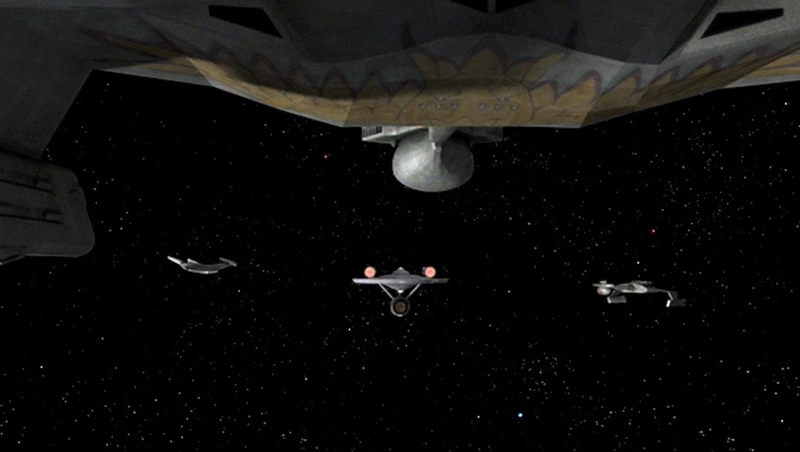 The creators made an interesting choice in the remastered version of this episode, making one of the three ships that surround the Enterprise a Bird of Prey from “Balance of Terror”, replacing a third Romulan/Klingon cruiser (as you can see in the photo above). It’s a nod to continuity and almost a wink to the idea that the creators in the ’60s used the Klingon ship model (which is much cooler looking than the Bird of Prey) here. The Romulan Star Empire — a mysterious former nemesis of Earth unheard from for a century — returns and destroys several border outposts with a mysterious and super-scary weapon. 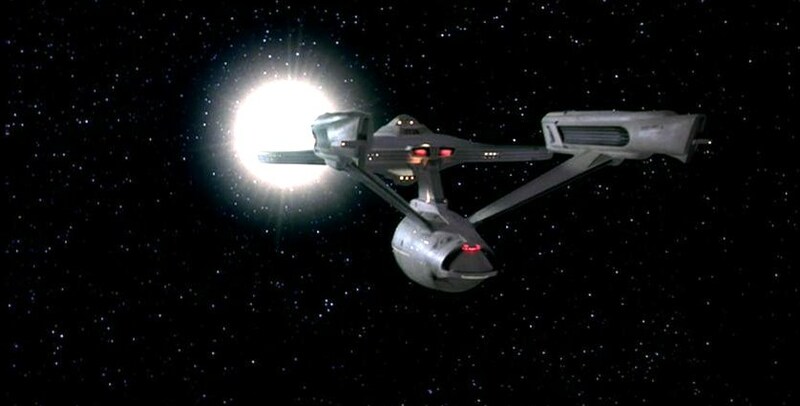 The Enterprise responds and has protracted battle sequences (think submarine warfare … in space!) before Kirk’s tactical genius bests Spock’s dad — err, the Romulan commander (Mark Lenard) — and destroys the invading ship preventing another war and cementing our boy Jimmy as, well, our boy Jimmy. He’s apparently of a kind. And a sorcerer! “Balance of Terror” introduces one of Trek’s main villains, the Romulans, and does so in a way that is amazingly consistent with what we see of them for the next 40 years — unlike, say, the Ferengi, who go from allegedly eating their enemies to caterers and bartenders in six years flat. 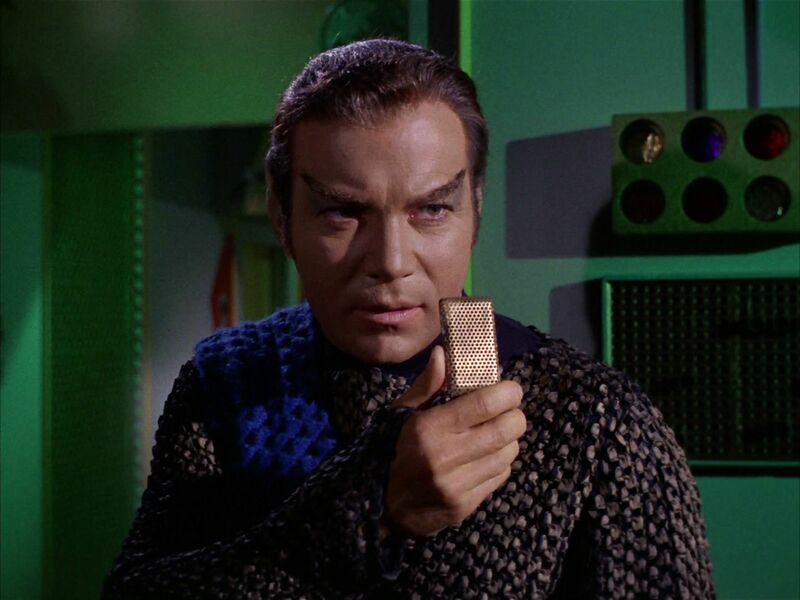 Of course, the episode also has the big reveal that the Romulans are offshoots of the Vulcans and introduces the concept of the cloaking device to Star Trek. It’s an extremely foundational hour of the franchise. 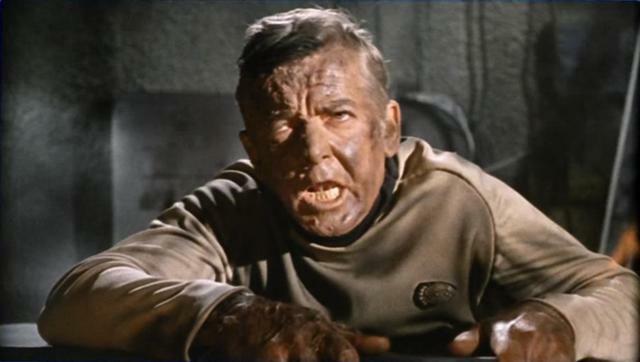 Just think if that racist dude Stiles (Paul Comi), the Enterprise’s navigator in this episode whose ancestors fought and died in the previous conflict with the Romulans, had stuck around! The previous conflict with the Romulans as stated by Spock and others, is too Earth-centric even for first-season TOS standards — and especially if you consider the events of “Star Trek: Enterprise” (but even if you don’t). Apparently, Earth’s war with the Romulans occurred after the coalition that would become the Federation was established in Enterprise’s final episode “These Are the Voyages …” but before the Federation itself was formed. Or something. 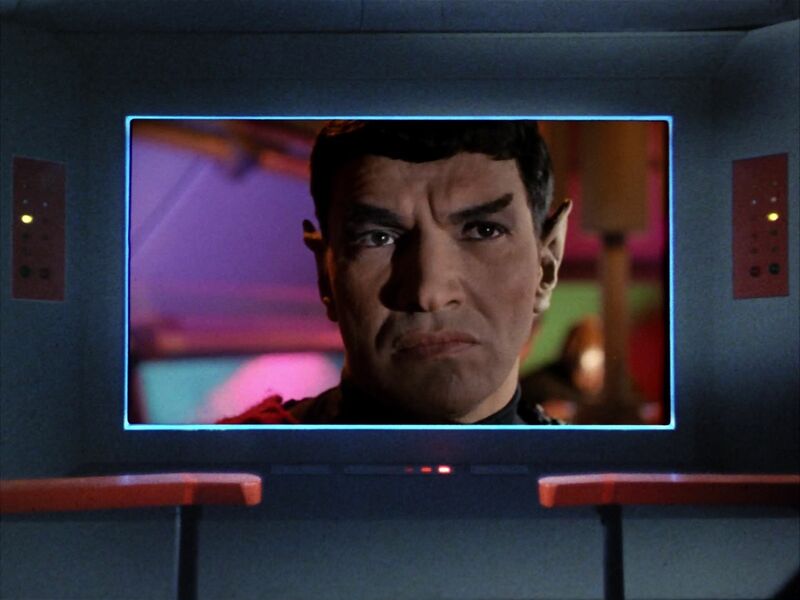 Dramatically, it’s interesting in “Balance of Terror” that the Romulans have never been seen by humans (and it sets up the Big Moment™ when Spock sees a dude who looks just like his pops on the viewscreen — even though we don’t see Mark Lenard playing Sarek until season two). But it’s hard to believe that no visual communication or prisoner taking was previously possible, based on the 22nd-century technology on “Enterprise,” to say nothing of the visual communications technology available in the real world in the 21st century. It’s too bad that Spock didn’t just say that the Romulans refused visual communication back in the day. That would have been more believable than the apparent lack of Skype on Romulus or Earth 150 years from now. Maybe the Romulans were just way into Snapchat? “Enterprise” also later pisses all over the wonderment of the cloaking device by giving Jonathan Archer’s crew’s a clear understanding of the technology and knowledge that the Romulans (and others) use it. “Selective bending of light,” indeed, Mr. Science Officer. Lastly, the bad science of TOS pops up by asserting that the Romulans are a real threat despite their vessel’s lack of warp drive. 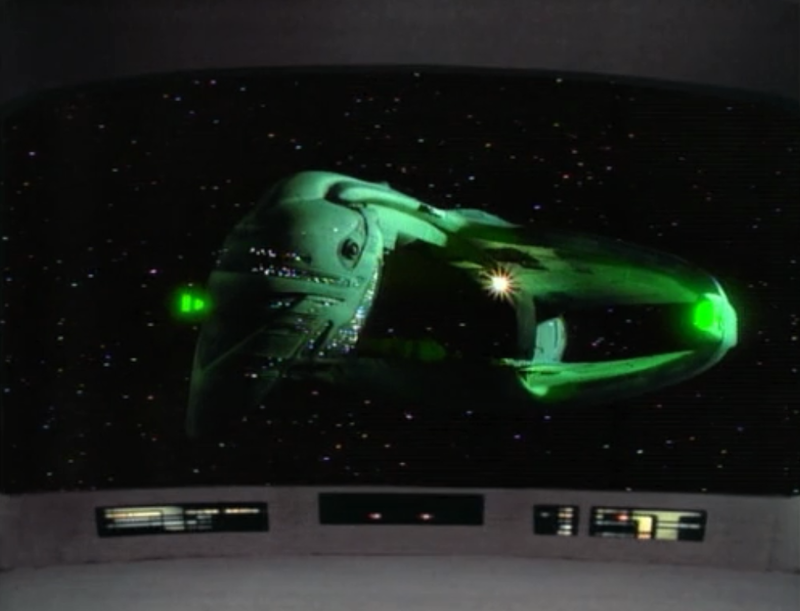 Maybe Romulans have warp (even though the Bird of Prey seen in this episode doesn’t) making the Romulans a threat to the Federation in a larger sense, as opposed to being on par with the goofy aliens from TNG’s “The Outrageous Okona.” But the cat-and-mouse game is undercut by the fact that the Enterprise should be able to outrun the Romulan vessel several times over. Complaints aside, it’s possible that this episode set up the very idea of recurring villains in Star Trek, a huge, huge deal. Soon after, the Klingons were introduced, and the two main rivals of TOS were set (with all due respect to a certain dude in a certain rubber lizard suit and Harcourt Fenton Mudd). Beyond that, “Balance of Terror” is fascinating because it’s willing to show actual bigotry (from a 23rd-century human!) as a way to show why bigotry is wrong and something humanity was still working to move past (and mostly succeeding). It’s very effective, but it’s also unusual for Trek and would have been unheard of in TNG, when all humans were apparently beyond such things.